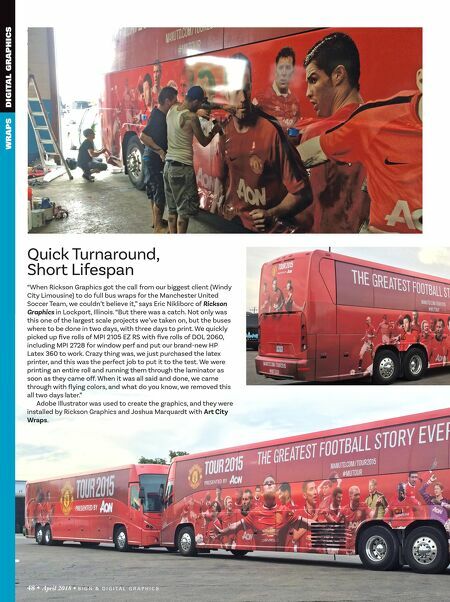 WRAPS DIGITAL GRAPHICS Wraps Projects CONTINUED 48 • April 2018 • S I G N & D I G I T A L G R A P H I C S Quick Turnaround, Short Lifespan "When Rickson Graphics got the call from our biggest client (Windy City Limousine) to do full bus wraps for the Manchester United Soccer Team, we couldn't believe it," says Eric Nikliborc of Rickson Graphics in Lockport, Illinois. "But there was a catch. Not only was this one of the largest scale projects we've taken on, but the buses where to be done in two days, with three days to print. We quickly picked up five rolls of MPI 2105 EZ RS with five rolls of DOL 2060, including MPI 2728 for window perf and put our brand-new HP Latex 360 to work. Crazy thing was, we just purchased the latex printer, and this was the perfect job to put it to the test. We were printing an entire roll and running them through the laminator as soon as they came off. When it was all said and done, we came through with flying colors, and what do you know, we removed this all two days later." 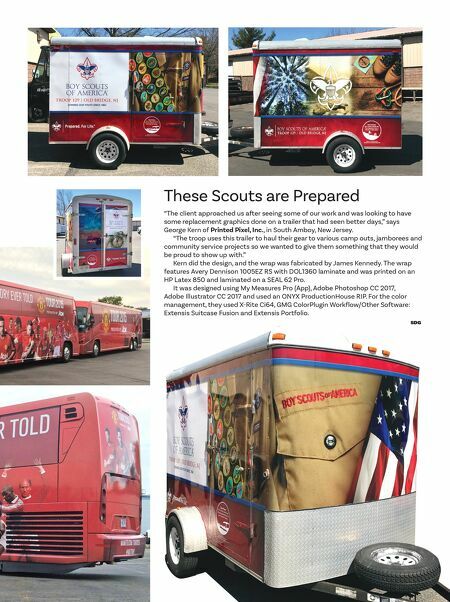 Adobe Illustrator was used to create the graphics, and they were installed by Rickson Graphics and Joshua Marquardt with Art City Wraps.